Nothing compares to the juicy, sun-sweetened goodness of vine-ripened tomatoes. These succulent fruits signal summer&#x27;s arrival with their red, rich hues. In the world of the tomato, there's much more than the traditional red slicers. There are bicolored beauties with sweet flavor, green, tender globes bursting with tart-sweet taste, and tiny golden jewels, just right for picking and popping into your mouth. Expand your tomato repertoire with a sampling of my gallery of home-grown goodness. 1999 All-America Selection. 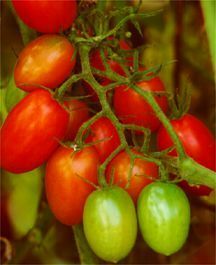 Holds the vine longer with less cracking than any other cherry tomato. Unusual elongated 1 ounce glossy red fruits are produced in grape-like clusters on long, high-yielding, indeterminate vines. Sweet flavor and high quality make this a favorite. Days to maturity: 60 days. 'Green Zebra' gets its name from the dark green stripes that streak its greenish-yellow skin. Its deep green flesh is both tart and sweet. Two inch diameter fruits are very delicious. Produces fruit until first frost. 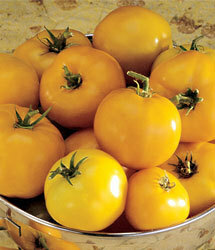 An eye-catching tomato, lemon-yellow throughout, with delicious flavor, Deep globe-shaped fruits average 6 to 7 ounces. Adds color spice to salads and tomato plates. Disease-resistant indeterminant plants. 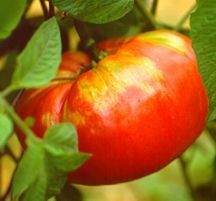 These heirloom tomatoes have a marvelously sweet taste, yellow skin dappled with orange streaks, and golden yellow flesh flecked with pinkish streaks. They make a stunning display in salads. A red-skinned selection of Brandywine. Has the luscious gourmet tomato flavor and meaty red flesh of regular Brandywine. Indeterminate potato leaf plants are very productive, bearing long harvests of 10 to 16-oz. fruits. 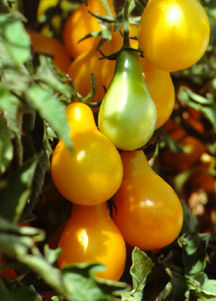 These miniature 1 3/4 to 2-inch pear-shaped yellow tomatoes are delightful in salads, for preserving, or for eating fresh right out of the garden. So delightfully sweet they are considered 'garden candy' by many. Tall, vigorous indeterminate vines bear profusely. I really love the yellow pear variety- so colorful and yummy! I cannot wait for the ultimate tomato garden this year! I am on a mission!!! The green zebra looks really cool--- i should try this one! Love all these! The Juliet always seem to be the first variety sold out at the Zilker Garden Show every year. They are prolific producers! Green Zebras are my youngest daughter&#x27;s favorite tomato, always requested in the summer when we visit Boggy Creek Farms. I grew yellow pear tomatoes this past summer and will definitely plant them again. My hope for this summer is one called &#x27;Beulah&#x27; which is an heirloom I received from some folks in TN. Hope it grows here in central Texas! Planting seeds this weekend! Ah, I have to get on seed starting as well!